Now – let me please recap, I have a ticket – printed ticket, for JFK. I am trying to board a plane for which I have NO TICKET – none whatsoever! Actually I have a ticket for a totally different airport! Think of me as one of those lost souls dropped on a plane. That was me! Of course, I have no checked luggage – for two days, but still, this is COOL! The unflappable stewardess, behind a massive closed door replies; the door is closed. The gate attendant is equally unflappable, and she fires back (sorry bad use of verbage) open the door, you forgot this guy! Will you believe – the stewardess blinked and opened the door! Heck these folks were half way through the security demonstration! I was told grab any seat – we need to move. I grabbed the first window seat I could find, and promptly went back to sleep! WOW!! By the time I land in Laguardia, I had two hours to go and once I finished davening, I hopped in a taxi and found my way to the City Winery. So, what is the City Winery, to be honest I did not get into all that with the Michael Dorf, Chief Executive Officer or David Lecomte, Chief Wine Maker. 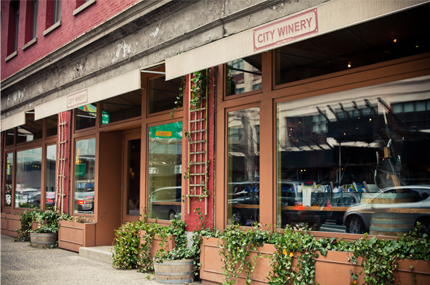 However, the basic premise of the City Winery, in the words of Dorf; In summary, our brand is starting to represent the image of being the highest-end experience combining a culinary and cultural offering. We are paying attention to our image from the time the consumer connects digitally through their onsite visit to the reputation and memory which lives on. However, wine is not the only part of the City Winery, Dorf is also a famous music promoter and that is the second arm of the winery – music. The intimate setting allows for small, close knit interactions with musicians that come to the venue to rock out or jazz out and enjoy the crowds of music fans, drinking wine made at the winery and beer made at the winery. It is a dual armed business that makes for a great combination of good times and libations – what more could anyone ask for? The Jewish Week is a magazine that has been part of Jewish New York scene for some many years, and reaches some 70,000 households, in the New York areas. This tasting is a bit more pedestrian than the Gotham Wine Tasting, but Costas canceled the event this year, and that meant there was no other cross-importer wine tasting other than this one. When I say pedestrian, I mean that the wines showed here are not the top wines of the wineries and importers. Some brought the expensive and high-end wines and some brought middling wines, but in the end the wine event turned out well for the Jewish Week. There was no VIP like event that Costas throws before the Gotham wine tasting – but such is life. I arrived to the winery and sure enough the room was abuzz with folks setting up wines and tables and I made a bee-line to Shai Ghermezian, the Vice President of Allied Importers. I did that because I wanted to say hello to him and ask him if I could dump my bag under his table, but before I could find him, I found Shlomo and Gary Landsman at the Royal Wines table and they were very kind to let me stash my bag under their wine table! Thanks guys!!!! After that I went on my rampage and being 40 minutes early, I had the time to take pictures of every bottle I was going to taste this afternoon. This time I did a very good job of using the wine list – that Yossie had on his website, and preset the wines I wanted to taste and took pictures of those wines and a few others I hoped to taste – if I had time, which I did. Three hours is not a lot of time to taste through a bunch of wines, but thankfully, I had tastes many of these wines in Israel, and I was focused here on the Israeli wines I missed in Israel (like Ramat Naftaly and Hebron Heights), and non-Israeli wines that were imported by others that do not have the name of Royal. Once I was finished photographing all the bottles, I had some 15 minutes and I started tasting wines a bit early – at least at Shai’s table. That was where I got the chance to taste the highly controversial 2011 Gvaot Pinot Noir. I loved the 2010 Gvaot Pinot Noir and many in Israel were screaming that the wine was clearly closed and not ready for drinking – but having drunk it now two times – I think it is a bit closed, but if given time or if you drink it right after opening it, the wine’s abilities come through clearly. I think it is not as good as the 2010, but as good as the 2009 for sure. I then tasted the second best white wine in the blind tasting that the Jewish Week judges scored; the 2012 Lanzur Sauvignon Blanc, and I found it to be OK, but there was a far better option in the 2011 Teperberg Sauvignon Blanc – a nice Blanc indeed. It is not as good as the 2012 Teperberg Sauvignon Blanc – but a nice wine anyway. I moved on to best table in the event, really part of bar, the City Winery wines. There were six wines to taste, and all of them are nice, excpet for the 2011 Oregon Pinot Noir that was a bit too thin and not really exciting. One thing I will note about all the wines at the City Winery table/bar is that the wines all show certain characteristics – that though they are nice tells me a lot about how those wines are made. The wines, all the wines, show a clear expression of mineral, graphite, crazy buckets of acid, and lots of tannin. I am not sure what Lecomte is doing exactly, but to have every wine taste and act the same – means one of two things – either the vineyards are managing to his exacting specifications, or the wines are slightly managed instead. Either way, I could care less, the wines are lovely and clearly managed, but if that makes Lecomte happy, that works for me. These wines are not flabby, they are not overly ripe, they are managed well, they are bright, acidic, well balanced, and full of mineral and mouth coating tannins. So, if you are looking for a classic Cali Cab – move on, but if you are looking for a well built Cali Cab – this table may well be to your likening, it was to mine. From there I made my way to the Happy Hearts table to taste through the Hevron Heights wines – wines that are hit or miss for me at times. A couple of time I taste them – they are awesome and sometimes they are all over the place. This time they were OK, but they too seem to be colluding with the rest of Israel on their 2009 sweet tooth. The biggest disappointment for me at the table was the 2011 Elone Mamre Chardonnay. I LOVED the 2010 Hevron Heights Elone Mamre Chardonnay, the 2011 is but a shadow of that great wine and one that is not worth the price, for me anyway. The best wine was the 2005 Hevron Heights Cabernet Sauvignon, Mount Herman, Reserve. The 2010 Odem Cabernet Franc, Reserve was also a letdown, but such is life. From there I made my way to the Israeli Wine Direct table. They are currently importing a few kosher wineries, including the wines from Agur winery, a winery I visited and loved, but there were many wines that I di not get a chance to taste with Shuki (the head wine maker and owner) in Israel – that visit requires an entire post on its own – soon I hope. One thing I can say about Agur winery – they make sure bet wines, that are controlled, exquisite, and unique – bravo!! Besides the Agur wines, I got the chance to taste some Ramot Naftaly wines, a winery that I missed when I was in the north on my last Israel trip. I liked them, and the wines being imported are clearly the classic wines, but many think his best wines are the more esoteric wines, the Malbec, Barbera, and Petite Verdot, wines that the winery is not exporting. I liked the classic French varietal wines and too bad if I feel differently than others – they were nice and controlled – and that is saying something. Clearly the IWD folks are climbing an uphill battle being yet another Israeli wine importer – but they have chosen great wineries and they have a very cool card in their hand – that will soon be one of the most talked about “secrets” in Israel – BRAVO!! From there I went to the Victor table and I had a love hate relationship. The importer is doing smart things, they are bringing in wines I tasted in Isarel, including Ella Valley wines (of which I spoke about here), and Ugav wines from the Jerusalem Gold Hills winery – which is a crazy good QPR set of wines. They also sell some French wines, which I could care less about and then they bring in a great bottle of 2011 O’Dwyers Creek Sauvignon Blanc – which was awesome! They also bring in some so-so wines from Argentina and Italy – which do not really float my boat – but are fine enough entry level wines. As usual, Recanati continues to create great wines that show control, finesse, and have a great QPR! The new 2012 Rose is nice, and though I have tasted all of the rest of these wines in Israel, I tasted the 2009 merlot reserve and the 2010 cab reserve and they are all showing quite nicely. From there I made my way to the Red Garden table. This table has some great ideas, but not many great implementations. The Tanya wines bored me essentially with his free hand on the oak and the fruit – way too out there for me. Yoram needs to start applying some control on his wines, in my opinion. The Tel Arza wines will make newbies very happy. They have some clearly good ideas, but the execution on them is lacking. The real winners at the table were two wines, one from Livni and one from Tura. I got a chance to visit Tura on my trip (not yet written up) and missed Livni. The Livni Reed Pipe, is a very strange blend of Cab and Pinot Noir, and other than the mystery man of Kinor David, I have not seen this blend anywhere else. From there, I found my way to the River table – and this was a real treat! I say this, not withstanding the fact that I had to taste yet another Kadesh Barnea wine. I must say that for a wine snob, like myself, Kadesh Barnea does not make a wine that I like – period. This tasting did nothing to change my mind, even though they made a Petite Verdot that many thought was OK. To me, I will pass thanks. Others think that the winery is the bomb, because they make wines that are so fruit forward, fruit bomb, new world, overly ripe, etc that it is easy to drink. It is like being served a platter of fruit – no finesse, no control, just overripe fruit in a bottle – not for me. The real treat at the table were the three bottles of wine from the now famous Weiss Brothers! I first met them when Benyo introduced them to me at his now famous Shabbaton, where I got to taste the 1-2 punch and Syraph. Since then they have made the Shirah winery and are producing great wines. I was one of the first to buy two of the wines at the tasting, but having not tasted the two newest ones, I was excited to taste them at the event. The 2010 Shirah Brodeux is awesome! It is a classic Bordeaux blend (with a great name) and a bit of Syrah for styling. The next wine was the 2011 Shirah Coalition – which was SICK (that is good). Finally, there was the newly bottled 2010 Thompson Syrah/Mourvedre – which is a bit out of flux right now, but will soon come down to planet earth – do not open this one for a year. From there the event was winding down and I ran around trying to get odds and ends to taste, including the newly minted 2009 Carmel Limited. That wine is over the top – for sure, but it is so well made that it covers up the overly ripe fruit. The 2009 Meron is not overripe and black and blue as they come. The 2009 Odem Limited (Odem Mountain Winery’s flagship wine), and it was not as well built as the Carmel limited – and it showed. Well that is the story of all the wines, but I have yet to get to the story about the event. As I was getting ready to come to NY for this trip, I bought tickets to this event for 20 bucks. It was at this moment that I knew we were screwed. Why? Because they were selling them like hotcakes, and there was not going to be enough room. In the past few years, from what I hear, the event was calm, lightly attended and normal. For this reason many of the tables did not bring their best wines – because they thought it was going to be another snooze fest. WOW were they wrong on both accounts! They forgot to take into account that Gotham was not throwing their wine extravaganza – and therefore, this was it for cross importer wine tasting. Everyone I spoke to told me so and it was a madhouse! I mean that it was as close to a fire hazard as it gets. GOD Forbid, if anyone pulled a fire alarm at the height of the event, may would have been trampled. I could not move without shoving people, and that is not my style. So, I waited and waited and waited till I could move a few feet. It was as busy as the deck on the titanic – as it was going down. The event itself was OK, and well attended, and they even tried to give out prizes, but no one could hear each other over the din of the sheer mass of people. Insane! Next year – they really must control the ticket count of move to a larger venue, I seriously wonder if the event was a fire code violation. In any event, the co-coordinators tried their best, but hat can you do when you sell so many tickets for half price? The good news for me was that I barely made it there, but I made it so far in advance that I could get started and then move through the madness at a normal pace. I knew exactly what I wanted to taste and where the bottles were, so I could move precisely to where I needed to go and not move all around. Still, for the rest of the crowd – all I can say is they had a great time and though they were crowded, the folks were happy. They were eating great cheese, drinking nice wines, and overall enjoying themselves. So there you have it – the wine event was one that I hope to be part of again next year, if they let me in – LOL!! I also hope that Gotham has not given up on their own wine event – but hey either way we have a plan. I tasted a few more wines from Allied – not at the tasting, but I put them down below, including a chance to taste again a 2010 Gvaot Pinot Noir and the newly released 2011 Gvaot Pinot Noir, along with a Borgo Reale Chianti, two of the recently released Saslove Cabernet Sauvignon, and a bottle of 2010 Gvaot – Vineyards dance Herodian. Thanks to Shai and his lovely wife for hosting me at their home for that tasting. It was great to just hangout and talk, something we could not pull off at the event as it was way too busy. After the tasting – we had the unique opportunity to taste through some of the kosher barrels at the City Winery, with a few of the wine nuts from Rogov’s forum, along with Yanky Drew and David Lecomte. Many thanks to the winery! There is a nice Argentina Malbec coming soon and a few other winners, including a very nice new Alder Spring Cabernet Franc and an interesting Chalk Hill Petite Verdot. Thanks so much to the Jewish Week and the City Winery for putting on the event and the tastings. The wine notes are below in the order they were tasted. The nose on this wine is nice and grassy with straw, white fruit that is perfumed under a canopy of floral notes. The mouth on this light to medium bodied wine is nice and bright with good grapefruit, fun gooseberry, peach, with stone fruit, along with slate and mineral. The finish is long and herbal with more mineral, grassy green and herbaceous notes abound, with good acid, with bitter notes of pith that linger. This cabernet is classic in nature and rich and lovely, but a bit expensive. The nose explodes with graphite, mineral, blackberry, dark cherry, and nice ripe fruit. The mouth is big and aggressive, with concentrated and layered fruit that is tart, zesty, and ripe raspberry, cassis, black plum, all wrapped up in nice sweet cedar, and crazy mouth coating tannin. The finish is nice and long with chocolate, tobacco, crazy butterscotch, and an aggressive attack of fruit, nice ripe and controlled body, good balancing acid, and vanilla. This will be a broken record but this wine may show a fair amount of acid one that needs time to settle, so do not be shocked when you open this wine expecting a nice fat California Cabernet. This is a ripe and bright Cabernet that is nice and edgy now, but if you want a bit calmer of a wine – wait a year or two. This is a nice green and balanced Cabernet Franc, a good example of what a ripe and balanced Franc can be. The nose on this wine is ripe with green fruit, green notes, mounds of graphite and mineral, herb, and bell pepper. The mouth is lovely with crazy gripping tannin, rich and layered green notes, ripe raspberry, plum, mineral core, great balancing acid, all wrapped up in almost no oak influence, other than in the rounded mouth. The finish is long and earthy, with chocolate, slate, zesty fruit, zesty ripe strawberry, and cherry linger. This is a broken record already (and just wait), this wine has a fair amount of acid and edginess, and yes live with it. This is not a wine that I would expect to be around in four or five years, but in a year the tannins will calm and the acid will integrate better with the wine’s body. Bravo a nice lush green and red wine with a good acid and mineral core! This wine was the only of the six City Winery wines that I tastes that I was not so impressed with, though it is a nice wine all the same. The nose on this ruby colored wine is filled with coffee, toffee, forest floor, and dried currants. The mouth is weird with an attack of zesty fruit, soft tannin, and dirty and round mouth, with strawberry, Kirshe cherry, with almost peach flavors. The finish is long and mineral with controlled oak, bright and crazy acid, vanilla, light toast, and hints of tar linger. This wine shows crazy acid, but it is not a wine that I think will improve greatly, though it does need a bit of time to settle and integrate to hide its current lacking. This may well have been the best Cabernet at the Jewish Week tasting – without question (though for full disclosure, Royal was pouring a better Cabernet – by a touch; the 2010 Covenant Cab, but I did not taste it again). The wine’s nose is super rich in mineral, graphite, but showing great control, along with blackberry, raspberry, and blackcurrant. The mouth on this full bodied, layered, and ripe wine with concentrated fruit – but shockingly controlled and finessed, with ripe cassis, black plum, sweet cedar, and mounds of fine tannin that are mouth coating and caressing. The finish is long and perfectly balanced with nice mineral, tobacco, chocolate, vanilla, butterscotch, cedar box, and crazy zesty and tart fruit. This wine made me stand up and take notice, for its insane finesse, mineral core, and balancing acid, that if I removed the first three characteristics, I would have sworn it was an Israeli Cabernet. Bravo and what a difference it is between flat/fat/flabby/overly ripe Israeli wines and this one. Also, this wine differs greatly from its younger brother (2010 vintage), which shows less finesse and more sledgehammer. This vintage is more comparable to a mad sledgehammer wielding man, which is so very different than its younger brother, which is more comparable to a professional ballerina to the nutcracker in a china shop. The nose on this wine shows more mineral than its 2009 vintage – which is hard to imagine; in and of itself. The mouth on this wine is rich, massive, and layered, and yet aggressive, but still showing finesse, with blackberry, black plum, without zesty fruit, that has massive mouth coating tannins, and all wrapped up in sweet cedar. The finish is long and spicy, that is balanced with good acidity, with far less mineral on the finish, nice crazy black pepper, nice malted chocolate, tar, tobacco, and nice ripe black fruit. This wine is the one that I have tasted this whole year that tastes as controlled, finessed, yet massive and layered and concentrated as the 2010 Covenant Cabernet Sauvignon – BRAVO! This wine is ready to go now and is integrated perfectly without burning acid that needs to settle. WOW this wine is as close to the Shirah PTTP and the Brobdignagian Syrah as it gets, because the grapes used for these wines are sourced from the same area. The nose on this purple black wine is shocking – BLACK and as opaque as it gets. The nose is rich and ripe with roasted meat (AKA dead animal), graphite, charcoal, licorice, toast, and spice. The mouth on this full bodied wine is big, aggressive, black and blue and red wine with a layered and rich attack of good ripe boysenberry, blueberry, blackberry, cassis, pipe tobacco, all wrapped up in sweet ripe fruit, sweet cedar box, mouth coating tannin, and ripe chewy black plum. The finish is long and rich with tobacco, tar, chocolate, and mineral – BRAVO! This is a big, ripe, round, aggressive wine with black and blue fruit, with nice notes of tar and roasted animal – very similar to other Cali Syrahs – with good acid, though the only City Winery wine that showed obvious in your face acid. This was a wine that I did not taste when I was in Israel, and it is the winery’s first release of a single Cabernet Franc varietal release. The wine’s nose shows tobacco, charcoal, and fruit. The medium bodied mouth is rich in mint, blackberry, black cherry, raspberry, wrapped in sweet cedar and mouth coating tannin. The finish is long and green with chocolate, good body, tobacco, and herbs. What a real let down for this wine, the 2010 was a lovely, rich, and luscious wine and this one is thin and boring. The nose on this wine is toasty, with peach, stone fruit, and apricot. The mouth on this light bodied wine is missing life, it is thin, not there and really a miss, with summer fruit, no tropical fruit, fig, and toady oak. The finish is medium long with nice mineral, tart fruit, and good acid. This is a lovely rich and toasty nose with good mineral, earth, and ripe black fruit. The wine has a charcoal and tobacco core with more crazy mineral, medium body, good mouth coating and lingering tannin, along with sweet cedar, yet nicely controlled, with ripe blackberry, sweet on the edge fruit, with black plum, along with an attack of candied, liquor styled, ripe, and layered fruit. The finish is long and mineral with attacking fruit, chocolate, tobacco, and more dark fruit lingers. This wine is interesting with its massive charcoal bomb, along with black pepper, cloves, blackberry, and dark cherry. The mouth is medium in weight with an attacking body of concentrated fruit, black cherry, sweeter notes than the other Hevron Heights wines (nothing new for the 2009 vintage), but still a bit controlled with black plum, and sweet cedar box, and raspberry. The finish is long with nice chocolate, tobacco, and layers of fruit, all showing an interesting body with sweet fruit, fig, and spice. The rich nose on this wine shows blackberry, plum, along with liquor and candied fruit. The mouth is very Israeli and new world, AKA fruit bomb, with layers of concentrated fruit, rich mouth coating tannin, with overripe blackberry, black cherry, raspberry, blackcurrant, and sweet cedar, with good acid. The finish is long and spicy with good complexity, mineral, graphite, zesty fruit, black and red fruit lingers with chocolate, vanilla, spice, and tannin. This blend of 40% Cabernet Sauvignon, 30% Merlot, 25% Cabernet Franc, and 5% Petite Verdot is a classic Bordeaux blend and one that came out quite nicely. The wine is controlled, not overly sweet, with good ripe fruit and spice. The nose is rich and expressive and perfumed with massive green notes, followed by a nice floral hit, and then forest fruit. The mouth on this medium bodied wine is rich and layered with nice blackberry, cherry, asparagus, crazy rich tannin, and mounds of leafy tobacco, all wrapped up with nice sweet cedar. The finish is long and spicy with good cloves and black pepper, cassis, raspberry, tar, and a hint of animal, licorice, and vanilla, and more crazy spice. I continue to be impressed by Shuki’s abilities and his great wines. This blend of 55% Cabernet Sauvignon, 25% Merlot, 15% Cabernet Franc, and 5% Petite Verdot is a classic Bordeaux blend and one that came out quite nicely. The nose starts out with big bold notes of charcoal, mineral, blackberry, and black cherry. The mouth on this full bodied blend is filled with concentrated fruit, raspberry, currant, mineral, and layers of sweet fruit, without herb and green notes, while being balanced with good acidity and rich and lingering mouth coating tannin, and sweet cedar. The finish is long and spicy with good cloves, black pepper, chocolate, vanilla, leather, nice leafy tobacco, tar, all in great balance – BRAVO!!! This is a winery I missed in my last trip to Israel and one I hope to get to in my next return. The wine is a blend of 60% Cabernet and 40% Merlot. The nose shows Cabernet stylings with great graphite, good control, green notes, pipe tobacco, and blackberry. The mouth is rich and layered and aggressive, with good control, nice black pepper, great spice, cherry, with baskets of cassis, full frontal tannin attack, and sweet cedar. This is a wine that some will see as way too out there, but I think it is a wine that with time will come into great balance and one that I would enjoy now. The finish is long and spicy, with nice green notes, good acidity, more spice, chocolate, vanilla, and layers of lingering red and black fruit. This is a winery I missed in my last trip to Israel and one I hope to get to in my next return. The wine is classical in its Israeli stylings and its Shiraz style. The nose is ripe with sweet fruit, black pepper, and lots of roasted meat, pipe tobacco, and mineral. The mouth is ripe with blueberry, blackberry, with a rich attack and blue and black fruit, full bodied with ripe controlled fruit, boysenberry, sweet black plum, spice, and tannins that linger long and sweet tobacco and cedar that warp it all up. The finish is long and spicy with licorice, leather, chocolate, tar, and rich fruit. The nose on this wine is filled with crazy tobacco, graphite nose, and slight sweet notes. The mouth is medium plus in weight with rich and ripe black fruit, cassis, blackberry, along with nice tannin, rich fruit, zesty and sweet raspberry, and good wood. The finish is long with mineral, bitter pith, and good oak influence. This was not the wine that I was expecting, which is a shame because I love Ella Valley wines. The nose is rich and filled with peach, apricot, and fig. The mouth is nice in body with good tropical fruit, pineapple, melon, kiwi, grapefruit, lemon, green apple, and nice oak. The finish is long and spicy with fruit, nice spice, bitter notes, mineral, slate, light floral notes, and a lingering sensation of honeysuckle. This once again proves that Recanati knows what it is doing and how it continues to be a QPR leader. The nose starts off green and nice with baskets of black fruit along with green fruit, while being controlled along with leafy tobacco. The mouth is full bodied and ripe with good control, lovely elegance, not an overripe fruit bomb, nor a attack force – but rather a controlled, mouth coating, elegant wine, with layers of fruit, good mouth coating tannin that rises, with good chocolate, sweet cedar, and graphite – Bravo – what a lovely mouth. The finish is long, spicy, and lingering with more black and green fruit, chocolate, mineral, nice aggressiveness, tobacco, and a hint of pith. Another great wine from Recanati with crazy tobacco, mineral, rich green notes, nice graphite, and light hints of dark overripe fruit. The medium+ bodied wine shows a mouth that is controlled but only so much, with blackberry, cassis, crazy black plum – almost zesty, hints of date appear, with black/red forest berries, nice mouth coating tannin and sweet cedar. The finish is long and spicy with good chocolate, tobacco, mineral, graphite, with green fruit and mineral lingering long. The nose is nice and controlled with great animal notes, mineral, graphite, date, and black forest fruit. The mouth on the medium bodied wine turns overripe and sweet with date, black cherry, blackberry, plum, and cranberry, with sweet cedar, and concentrated fruit, with insane tannin. The finish is long and spicy with animal lingering, deep earthy notes, coffee, graphite, along with green and red fruit. The nose is filled with deeply tilled earth, forest floor, candied cherry, and date. The mouth is way over the top with sweet leanings, date, raisin, blackcurrant, with cedar and tannin. The finish is long and earthy with sweet candied cherry, candied Kirsch, coffee, oriental spice, and cloves. This wine is a blend of Petite Verdot, Cabernet Sauvignon, and yes Cote de Rhone – WHAT! That was what I was told when I asked for the varietals in this wine, yeah – so this is a wine made up of PV, Cab, and many other southern France grapes. The nose on this wine shows sweet notes, roasted animal, along with Kirsch cherry and raspberry. The mouth on this interesting blend has a medium+ body with crazy tannin, along with a rich attack of fruit, candied cherry, tons of currant and cranberry. The finish is long and spicy with coffee, crazy spice, oriental spices, cloves, black pepper, chocolate, with tannin that rises with rich mineral and graphite. The wine is a classic over the top Cabernet with candied fruit, date, and a hint of cherry. The mouth on this medium bodied wine is aggressive, over the top with sweet overripe fruit, chocolate, candied cherry, crazy mouth drying tannin, blackberry, and tar. The finish is long and spicy with a deep-rooted attack of earth, mineral, spices, cloves, coffee, and black fruit. The nose is a bit more controlled than the Cabernet, but it is still a bit too far out there, with nice green notes, and plum. The mouth is medium in weight with crazy mouth drying tannin, along with a fruit assault of blackberry, blackcurrant, charcoal, plum, and cedar. The finish is long and spicy, with chocolate, tobacco, and mineral. The nose on this wine is very closed and not easily accessible, the wine is a blend of 55% Cabernet Sauvignon, 30% Merlot, and 5% Shiraz. The mouth on this medium bodied wine is super fruity with over the top candied fruit, candied and liquored plum, candied cherry, raspberry, and blackberry jam with cedar and more Tanya styled mouth drying tannin. The finish is long and spicy with far more sweet notes and spice – not for me. This wine to me was one of the clear winners of the tasting to me, outside of the crazy good City Winery wines). The wine is a blend of 53% Cabernet Sauvignon, 16% Merlot, 21% Petit Verdot, and 10% Cabernet Franc. The nose on this black colored wine is a rich nose of graphite, mineral, blackberry, and slate. This wine is a full bodied and WOW wine to me, with unbelievable finesse, rich layered concentrated fruit of plum, great blackberry fruit, black cherry, along with pipe tobacco, lovely mouth coating tannin that linger and caress, with good oak influence. The finish is long and spicy with rich layers of dark fruit, chocolate, coffee, slate, herb, and rich spice, cloves, and oriental spices – BRAVO!!! This wine continues the style of Livni – big, aggressive, and in your face kind of wine style. This wine has an over the top nose with sweet dates and raisin. The mouth is huge, aggressive, and attacking with massive mouthfeel and uncontrollable date, and new world stylings, more date, candied cherry, candied plum, blackberry liqueur, with crazy mouth drying tannin, and sweet cedar. The finish is long and spicy with chocolate, candy, tobacco, and green notes. This wine is a lovely wine with crazy spice and one with a very unique blend of 90% Cabernet Sauvignon and 10% Pinot Noir. The nose explodes with black pepper, rich mineral, light animal notes, and coffee. The mouth on this medium+ bodied wine is filled with charcoal, rich layers of plum, blackberry, along with sweet concentrated fruit that is controlled and contained by mouth coating tannin and oak. The finish is long with crazy mineral, lovely acid, green notes, massive tobacco, chocolate, along with a sensation of having licked pencil shavings. This was a fun wine and worth finding. Sorry – this is yet another wine from this company that I cannot bring myself to drink. All the nice labels in the world cannot save this wine, one simple word: SWEET! This tastes like date butter, raisin compress, and who knows what else, I tried my best. A few of my wine freak friends said it is OK, sorry, I cannot appreciate it. This was as close as the winner of the show as you can get other than the crazy City Winery Cabernet – BRAVO GUYS! The wine is a blend of 36% Cabernet Sauvignon, 18% Cabernet Franc, 18% Malbec, 18% Petite Verdot, and 10% Syrah – Hey they never promised a Bordeaux blend – just a good name! The nose on this wine is nice and balanced with tobacco, mineral, herb, along with cherry, and green notes. The mouth on this medium+ bodied wine is classical Bordeaux (not withstanding the Syrah), with lovely green bell pepper, blackberry, tobacco, along with great layers of concentrated, extracted fruit sweet and ripe fruit, nice acid, almost mouth searing tannin, and good sweet cedar. The finish is long and spicy with nice chocolate, mineral, rich mouthfeel, hints of date, and charcoal on the long lingering and rich finish – BRAVO!!! This wine is a blend of 60% Zinfandel, 12% Merlot, 12% Cabernet Franc, and 8% Touriga Nacional. The wine is a unique blend, just like its older 2010 vintage. The nose explodes with crazy wine aromas – the kind of attack that only the Weiss brothers can bring you, heavy notes of blackberry, date, watermelon, spice, cranberry, and chocolate. The mouth on this crazy full bodied wine is ripe, concentrated, extracted, and layered with control and style, black plum, ripe zesty raspberry, hints of white peach, mounds of tannin, and sweet cedar. The finish is long and spicy with cloves, black pepper, insane tannins that linger long, with candied currant, fig, tobacco, and mineral. This is a wine that is teetering on the edge of madness and sweetness, but only the Weiss brothers can pull this off – BRAVO!!! This is unfortunately another example of the overripe fruit epidemic that is taking over the 2009 Israeli vintage. The blend on this flagship Odem Mountain Winery wine is 36% Merlot, 55% Cabernet Sauvignon, and 9% Cabernet Franc. The nose is riddled with sweet fruit, liquors galore, and candied fruit. The mouth on this rich, layered, and candied mouth is filled with overripe fruit, date, cherry, blackberry, mineral, and sweet cedar. This is a wine I can see some liking – given its richness and expressive fruitiness – but not for me. The finish is long and spicy with chocolate, good spice, tobacco, more tannin, cloves, and black pepper. This is a wine that is a bit of a funk right now, a wine that needs time and deserves it given where this wine can clearly be heading. The wine is a clear buy wine, but one that needs time to come into itself. The nose starts off with a crazy and out of control nose of liquored and drunk blackberry, candied grapefruit (yes grapefruit! ), candied cherry, and insane spice. Well the mouth is close to indescribable – but I will try. The mouth on this layered and rich full bodied wine is out of control with layers of concentrated and ripe fruit, yet somehow controlled for the most part, with blackberry, black plum, zesty strawberry, ripe black cherry, that again is inches away from the over the top cliff, but once again the Weiss brothers steer clear with good sweet cedar and enough tannin to burn a hole in your mouth. The finish is long with a sensation of overripe characteristics coming into focus with cardamom, oriental spice, cloves, chocolate, boysenberry, along with a massive and assaulting attack of tar, green notes, and tobacco. Please wait on this to come together and BRAVO Weiss brothers! I must place a disclaimer here – this wine is filthy and concentrated, extracted, rich, and insane, and the reason it did not score in the stratosphere is because the fruit is candied and sweet. This is a classic example of an uncontrolled wine that can still work – if the wine is so richly built and so expertly executed that who cares. The nose on this wine is redolent with nice candied fruit, date, graphite, and cherry. The mouth on this full bodied wine, is rich, layered, and insanely concentrated, with extracted fruit, searing tannin, blackberry, cassis, lovely graphite, sweet cedar and a sense of wine that takes your breath away. The finish is long and rich with chocolate, tobacco, crazy mineral, and spice. WOW what a rich and layered wine – bravo, but the overripe fruit is just too much – sad, even the king of Carmel could not hide from the sweet tooth epidemic of the 2009 vintage. The nose on this wine starts off with cherry, mineral, graphite, floral notes, and red fruit. The mouth on this medium bodied wine is filled with toast, red fruit, plum, raspberry, Kirsch cherry, along with good spice, soft tannin, and light cedar. The finish is long with tobacco, coffee, toffee, and spices. This wine is in drink now to drink up mode. The wine is a blend of 72% Syrah, 19% Petit Verdot, and 9% Cabernet Sauvignon. The nose explodes with boysenberry, cherry, cassis, plum, and rich toffee. The mouth on this rich and layered full bodied wine is filled with nice animal notes, blueberry, cherry, blackberry, spices galore, chocolate, searing tannin, and more black and blue ripe fruit! The finish is long and spicy with good mineral, plum, cloves, licorice, and black pepper – yum! The nose is quite nice with cherry, raspberry, dried currant, and some nice date. The mouth is ripe and round with medium body and good herb and spice that helps to pick the wine up with plum, and red fruit. The finish is medium long and spicy with cloves and herb. The nose on this wine is somewhat different than the wine itself – which is concerning, but the mouth is so fantastic that it is easily worth looking past. The nose is unique with ripe and tart strawberry, cherry, tart raspberry, plum, along with dirty dusty notes and some mushrooms. The mouth is rich, layered, concentrated, and mind blowing all at the same time, with layers upon layers of mouth drying tannin, wonderful controlled fruit, more dirt and terroir, along with ripe concentrated blackberry, black plum, green notes, sweet cedar, and an overal great finesse/big body that makes you stand and take notice. The finish is long and spicy with black pepper, spice, cloves, chocolate, green bell pepper, and tannins that linger and rise and really impresses. This saslove Cabernet’s nose is congruent with its body and in many ways a more finessed and impressive wine. The nose hits you with menthol, graphite, charcoal, ripe blackberry, and lovely green notes. The mouth is rich, layered, and truly an artful and finesse wine with a combination of concentrated yet controlled fruit, with ripe sweet cassis, black plum, blackcurrant, wonderful mouth coating tannin that lingers forever, great balancing acid, and sweet cedar to bring it all together. The finish is long and green with sweet herb, mineral, chocolate, spice, and tobacco – that all linger long with sweet tannin. Posted on March 11, 2013, in Food and drink, Israel, Israeli Wine, Kosher Red Wine, Kosher Rose Wine, Kosher White Wine, Kosher Wine, Wine, Wine Tasting and tagged Adom, Agur Winery, Alder Springs, Barbera, Bettonelli Vineyards, Borgo Reale, Bro Deux, Cabernet - Merlot - Syrah, Cabernet Franc, Cabernet Sauvignon, Carmel Winery, Chardonnay, Chianti, City Winery, coalition, Duet, Ella Valley Winery, Elone Mamre, Gofna, Gvaot Winery, Herodion, Hevron Heights Winery, Hyland Vineyard, Ivri, Kadesh Barnea, Kessem, lanzur, Limited, Limited Edition, Livni Winery, Makhpelah, Malbec, Mediterranean Blend, Merlot, Mount Hevron, Mountain Peak, O'dwyers Creek, Obsidian Ridge, Odem Mountain Winery, Oregon, Petite Verdot, Pinot Noir, Ramot Naftaly, Recanati Winery, Reed Pipe, Reserve, Rose, Saslove Winery, Sauvignon Blanc, Sdeh Calev, Shiloh WInery, Shirah Winery, Shiraz, Special Reserve, Syrah, Syrah - Mourvedre, Tanya Winery, Tel Arza, Teperberg Winery, Terra, Thompson Vineyard, Tura Winery, Vineyard Dance. Bookmark the permalink. 5 Comments.